Naughty Dog claims to have maxed out the PlayStation 3. As we approach what could be our first glimpse at Sony's next system, PlayStation 3 developers should know the middle-aged console pretty well by now. 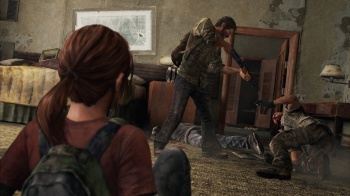 Naughty Dog is one of those developers and in a recent interview, The Last of Us Lead Designer Jacob Minkoff claims that not only does his team know the console inside and out, they've officially maxed out its available power. "I think Uncharted 1 used maybe 30 percent efficiency. Uncharted 2 we were finally using 100 percent, but it wasn't as efficient as it could be. Then, Uncharted 3 we got way more efficient," Minkoff explains. "With The Last of Us, we are as efficient as we can possibly be. It's just squeezing every last drop of power out of the system. And it's a system we know really, really well. We know its constraints, so we can push it to the edges and play it really fast and loose because we know what the system can handle." Now, being the seasoned developer that Naughty Dog is, we'd never expect the company to boast about anything other than having a perfect handle on its hot new title. You'll never hear a project lead claim that their newest, unreleased work is 97% as good as it could be, and as new engines are built, new things are always possible. Still, it's interesting to hear how the experience of creating a trio of high-profile titles has honed the team's skills, and if The Last of Us is indeed more technically impressive than the latest Uncharted effort, it'll certainly be a sight to behold.